Traumatic brain injuries (TBI) are a common result of car accidents and can occur as either open or closed-head injuries. Approximately 14 percent of all traumatic brain injuries in the United States happen because of motor vehicle collisions, and around 140 people die each day as a result of TBI-related injuries. Those who survive with a TBI often face a long rehabilitation process and ongoing complications from the injury. The long-term costs of treating and living with brain damage can easily run hundreds of thousands of dollars or more. If you or a loved one suffered a TBI in a car accident, it is important for you to understand your legal rights. The personal injury lawyers at Underwood Law Office have decades of collective experience helping victims who sustained serious injuries in wrecks. We understand how devastating a TBI can be. We can start helping you now. To get going, simply call us or fill out an online contact form for a free review of your claim and advice about your legal right to compensation. Symptoms of TBI vary depending on the extent and type of the damage to the brain. Concussions make up around 75 percent of TBIs and can cause short-term memory and cognitive (thinking) impairments, as well as increasing the risk of dementia and other complications over the long run. More serious TBIs may result in long-term cognitive impairment, vision and hearing loss, seizures, memory impairment, and changes in behavior and personality that persist over the course of months, years or even the rest of the victim’s life. If someone else was to blame for the accident, you are likely entitled to full compensation for all medical costs related to your TBI, as well as the cost of ongoing treatment and adaptive medical devices. If a TBI makes it impossible for you to continue working or if it reduces the amount of money you can earn, you may be compensated for lost wages and lost earning potential. If a TBI causes pain and suffering, emotional distress or a decline in quality of life, you may be paid compensation for those losses as well. Close family members of someone killed as a result of a TBI may recover wrongful death damages, including lost companionship and funeral costs. To obtain compensation, you will need to prove that another driver or other party was responsible for the crash that caused the TBI. What Should I do if I Have Suffered a TBI in a Collision? If you sustain any blow to the head as a result of a car accident, you need to get prompt medical treatment. Sometimes internal bleeding in the brain will not cause immediate symptoms, but could be deadly without proper treatment. You should make sure you get a full, comprehensive and accurate diagnosis. The full extent of TBI symptoms may not be known until several weeks or even several months have passed. It may not be immediately clear how well your brain will recover from the trauma. Contacting a lawyer is also important. You may recover compensation for TBI losses through negotiation of an out-of-court settlement or by taking a personal injury claim to court. Your attorney can investigate your case and identify the defendants who were responsible for the TBI, and then take the appropriate legal action to maximize your chance of recovering full compensation. 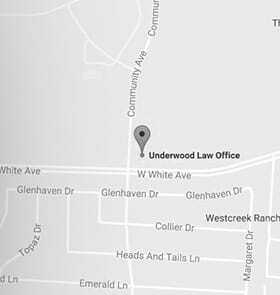 At Underwood Law Office, our mission is to ensure victims are fully compensated for all injuries that occur as a result of a car accident. TBIs are among the most serious of all motor vehicle injuries. It is crucial that you get the money you need to cover medical bills, rehabilitation costs, lost wages, adaptive devices and other losses related to your brain injury. The lawyers at Underwood Law Office want to help you recover the maximum compensation available to you under personal injury laws. Let a Traumatic Brain Injury TBI Lawyer at the Underwood Law Office help after your accident. We have handled many decades of personal injury cases. Our trial lawyers can help you recover the maximum compensation available in your Traumatic Brain Injury (TBI) case. Our McKinney, Texas law firm serves all of Dallas and Fort Worth, including Plano, Frisco, Allen and McKinney. Our Huntington, West Virginia attorney office serves all of West Virginia. For both offices, call our toll-free number 844.UNDERWOOD (844.863.3796) for a free consultation about a fair settlement. You pay no fee unless we win. To schedule a free and confidential consultation about the legal options available to you, call us now or use our online form.